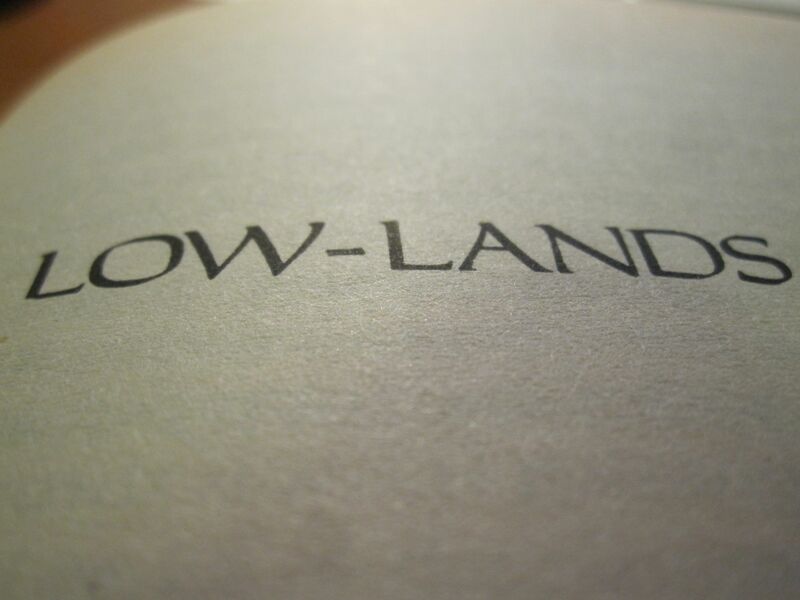 “Low-Lands” is an early artifact of Pynchon’s work where you’re immediately aware of that signature sense of revelation waiting just beyond the horizon of the text. Sadly this sense ultimately gets lost amongst all the mixed signals permeating the text. Rather than hinting at greater revelations upon multiple readings, its pat conclusion destroys the sense of wonder that the earlier portion of the text builds. Perhaps I shouldn’t say pat. There’s very little in Pynchon’s work that the word pat could be used as a description. Maybe I’m just reacting to the let down after reading the story. Coming back to “Low-Lands” made me long for the works that I’ll be getting to further down the line. There’s good reason for this reaction though. “Low-Lands” gives all the signals of early Pynchon at his esoteric best: long passages exploring the mysteries of ennui, the inexplicable nature of life, hijinks and humorous asides, our interconnected existence, psychology and the unhinged doctors who occasionally practice it, dream-like journeys through unlikely settings, and (though the list could go on) Pig Bodine. While all the pieces are set for the game, the reader is likely to be left wondering if this is the game she or he thought it was. Sadly, this question doesn’t come up in the usual way it does with Pynchon either. Rather than realizing that you’re in three-dimensional chess, you realize that you’re playing checkers. Again, I’m being too harsh. Prior to V., and Gravity’s Rainbow, “Low-Lands” really does have a good deal going for it. Let’s begin: Dennis Flange, the story’s protagonist, has issues. He’s in an unhappy marriage, in love/awe of the ocean, which has an extreme psychological influence on him. This influence is such that it compels him to live near it while at the same time seeking the help of a psychoanalyst named Geronimo Diaz. The story’s conflict gets going when Pig Bodine shows up at Flange’s home, a thing he has been forbidden from doing. This infraction causes Cindy, Flange’s estranged wife, to kick Flange out and end the marriage. Flange finds refuge with the refuse at a local garbage dump thanks to his garbage-man buddy, Rocco Squarcione. As an aside, I should have mentioned another area where Pynchon is firing on all cylinders in this story: the names. Even Cindy and Dennis seem well chosen. Paired with the surname Flange, these mundane names help give them dual qualities. A flange is the external or internal rim that adds strength to an I or T beam. By their nature these two are separated by a crevice (or…a low land? – ugh. I feel bad for even pointing that one out. Too obvious to waste your time with.) More importantly, I think, is the mundane nature of their first names. It hints at the more prevalent sense of ennui at the start of the story. I don’t want to give away too much for those interested in reading the story. Ultimately it’s worth the effort. The end result is that one of “them” is a young woman, Nerissa, who “seduces” Flange away to a new destiny. This destiny is a troubling one that, overall, I’m not sure about. The final deciding point for Flange in his new life is Nerissa’s motherly nature. As Flange gives up on his marriage to Cindy the text turns to a focus on children. As the narration notes, Flange would not have left, “maybe if they had kids…” (60). The focus here is simply that the saving grace for the marriage would be children. Flange becomes attached to the idea, or perhaps ideal of family through Nerissa’s motherly nature. As he thinks to himself: “I wonder why Cindy and I never had a child. And: A child makes it all right. Let the world shrink to a boccie ball” (74). This attachment leads him to accept Nerissa and give up on his previous life. Unlike a lot of Pynchon’s endings, this one is just a bit too convenient for me. I’m not certain that it’s meant to be though. There are just a few too many off notes in the story. They ring discordantly (and not in the “make you sit up and pay attention” good way). Cindy is too hollow. Nerissa is too sexualized along racial stereotypes. Neither is a full-fledged character. Worse yet, there’s a bit of a cavalier attitude towards parenting. It’s impossible to re-read this story after novels like Vineland, Against the Day, or even Inherent Vice and not see a very inexperienced author at work here. Parenthood becomes an answer and a choice, but it is one presented without the insight an actual parent has about what comes after that choice. This longish passage seems to point towards some of the complexity of parenthood. Flange’s exposure that comes with the shrinking of that sphere is exactly the boccie ball he mentions in relation to parenthood. It would require the reversal of that low land in which he’s sheltered. Furthermore, Flange has an obsession with mother figures, which is again, related to his infatuation with the ocean. It is, as Flange’s analyst notes, the first blood for life since it served as “blood” for protozoa, As the narration puts it, “the sea was quite literally in our blood, and more important, the sea – rather than, as is popularly held, the earth – is the true mother image for us all” (57). Thus Flanges search comes down to the search for a mother, but not necessarily his mother. Rather he finds at the end of the story the mother for his child(ren). The process of change that Flange sees his life in is this motion towards convexity: being expelled from the inclosure and, once accepting of that exposure, beginning the life process again through parenthood. Alright, enough. I’ve just about exhausted my approaches to this story. There’s more here (both troubling and intriguing) that would lead me to look at the story in a more flattering light. Instead I’ll just leave it at its most basic: “Low-Lands” is a promise for the glorious complexity of what’s to come in Pynchon’s repertoire.